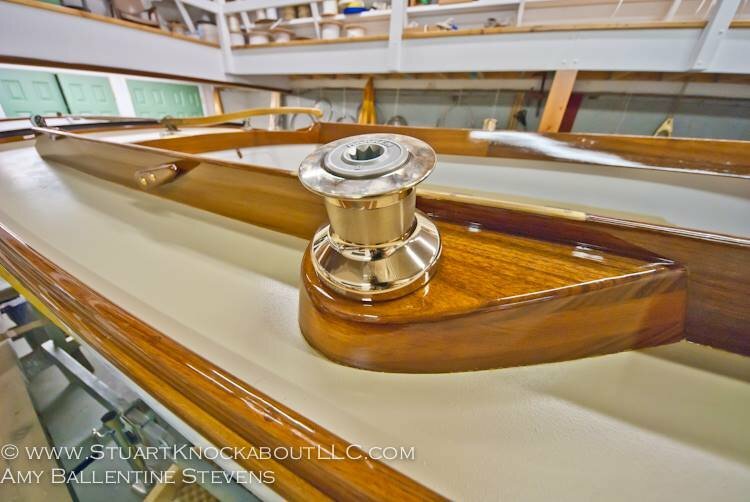 Preparing to board the Stuart Knockabout, your view of her deck and cockpit layout will impress you with an inviting feeling of spaciousness and security. 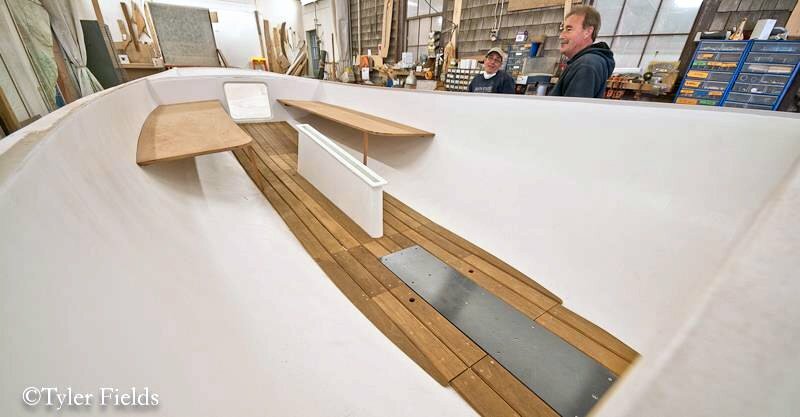 Her deck is low to the water and her cockpit depth is ideal for comfortable sitting and walking around. Stepping from her deck down into the cockpit, or vice versa, is a relatively easy maneuver. Her cockpit is big and comfortable. You are neither perched up nor sunk down. All the vertical and athwartships dimensions are perfect. The seats are generous, flat slabs enabling you to slide around while in a sitting posture and they allow a wide variety of positions and angles, so on a long day's sail you are not cramped and have plenty of legroom. 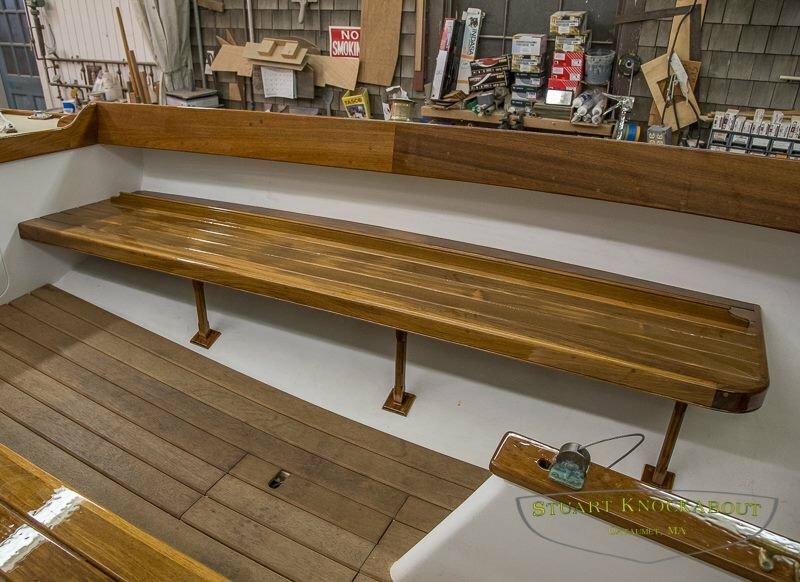 The opposing seat's edge is a good footrest when she heels, and the coaming is flared to the proper angle for a backrest. 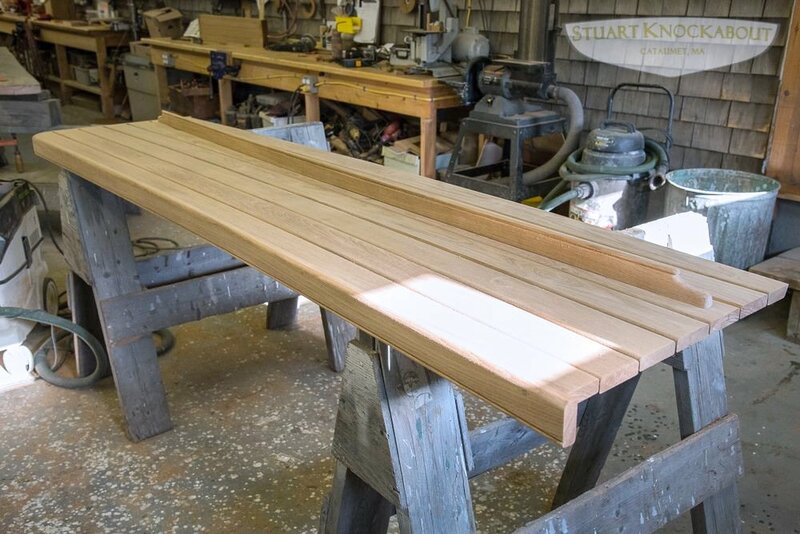 These seats, in either painted plywood or slatted teak, are also handy to stand or walk on. 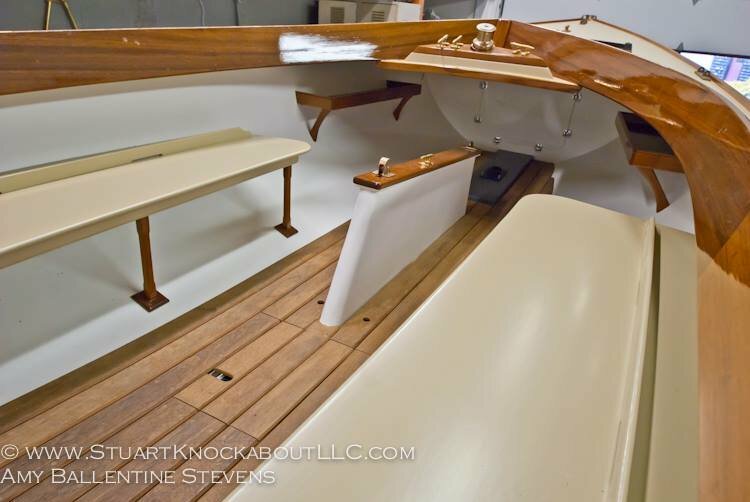 The outboard portion of the seats are fiddled so that gear, lines, etc. cannot come adrift due to heeling. 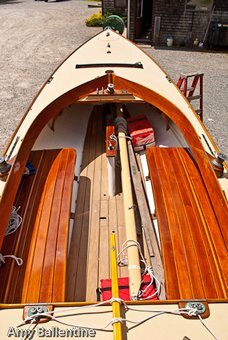 The Knockabout's cockpit is 9-1/2 feet long and every bit of it is always useful. 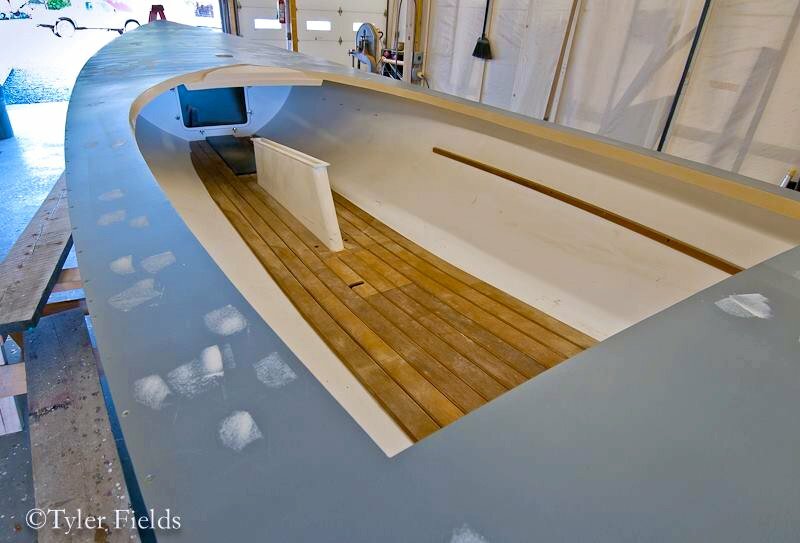 The decked-over space forward of the open cockpit is liberal in size, making plenty of dry area to store sails, clothing or whatever. There are also shelves on both sides which are within reach from the cockpit. 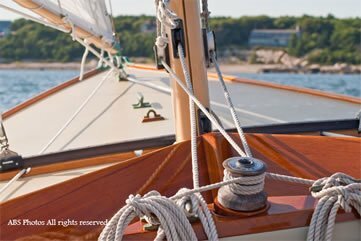 I keep an anchor and an oar in the forward compartment and the spinnaker pole stores hanging just under the deck to one side. Aft of the cockpit, the stern locker is also quite adequate, ­a good place to keep all things you occasionally need or want to have handy when you're sailing alone. The portion of the volume of this compartment, which is not needed for storage, is filled with foam to provide addition­al flotation located aft. The volume of the forward compartment is quite large. 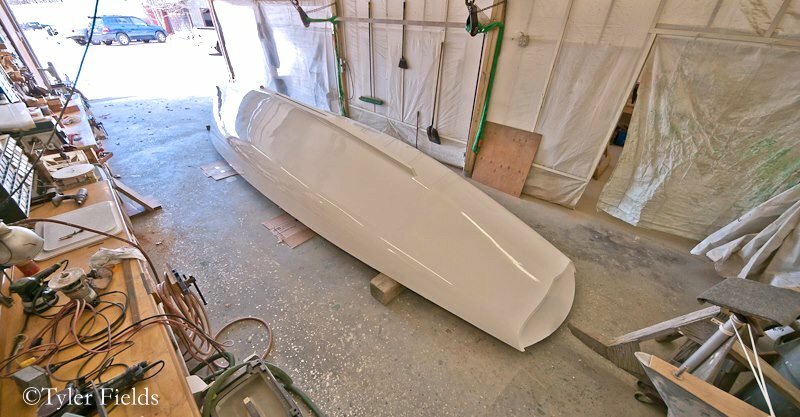 It has a watertight bulkhead and provides a major portion of the overall flotation as an air tank. It may also be used to store the sort of gear which is unlikely to be used frequently. An access door is gasketed and equipped with special dogging hardware. The Knockabout's rig is really quite conservative, especially compared to other early designs. She carries only 265 sq. 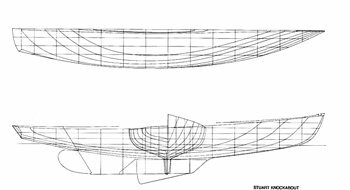 ft. of sail, and the plan is nicely divided for sail handling and delicately balanced steering. Despite this moderate sized sail plan, she's surprisingly fast in light winds and she certainly is when it breezes up. 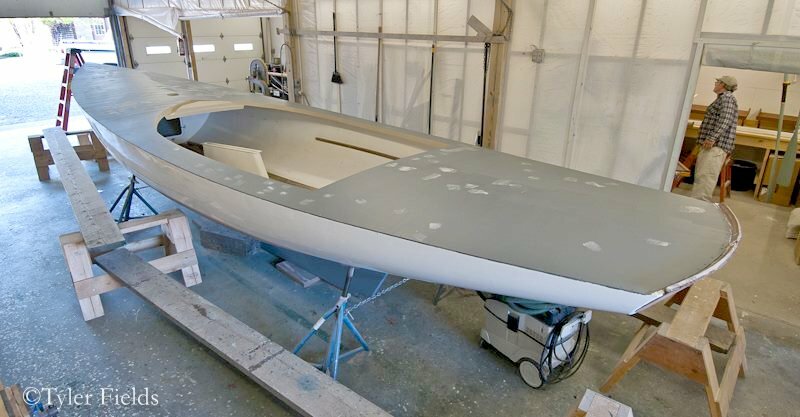 A good, deep-keeled, modern racing design of comparable weight and size with 100 sq. ft. more sail area may have a slight advantage in real light going, but the situation is reversed when it freshens a bit. 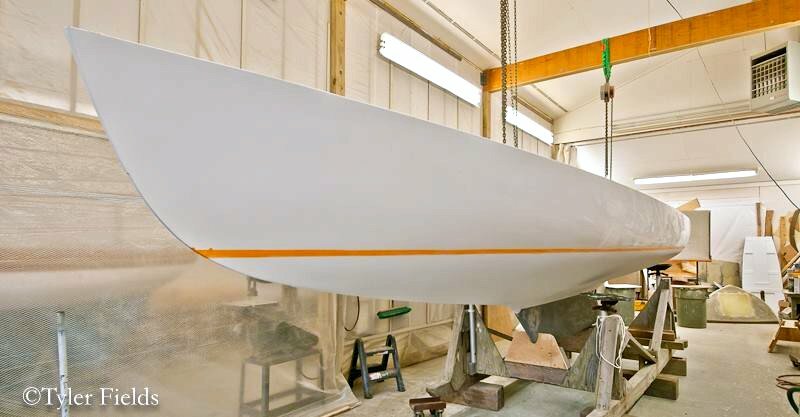 The mainsail is equipped for slab reefing and the jib also can be reefed to its club. 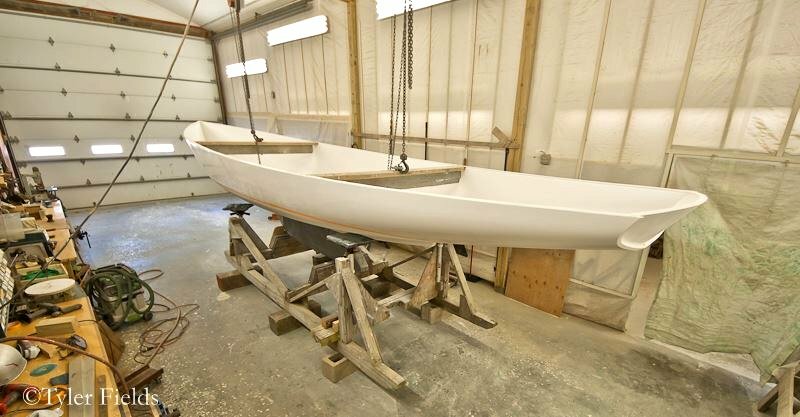 A Genoa can be added to her sail plan, and it really livens her up in wind under 12 knots. 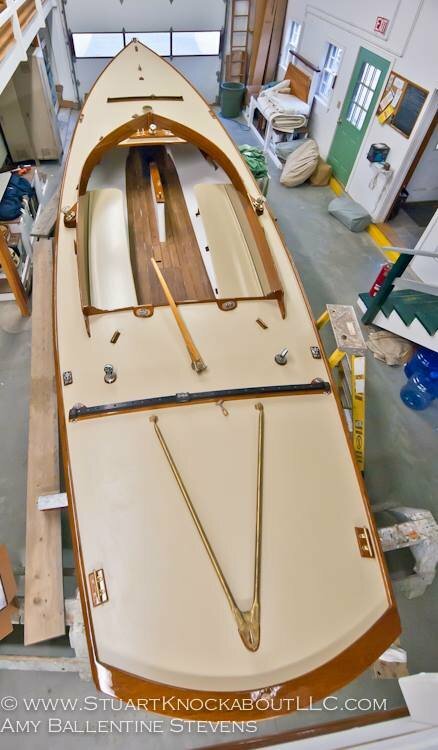 The main sheet is a 4-part tackle, double-ended to the aft corners of the cockpit, close at hand for the helmsman's quick attention. This sheeting arrangement also makes effective use of a 5 foot long traveller and a wide range of trimming possibilities. 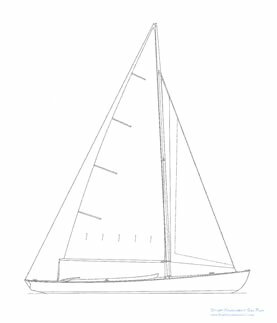 One of the additions we've made to the design is a club­footed, self-tending jib. 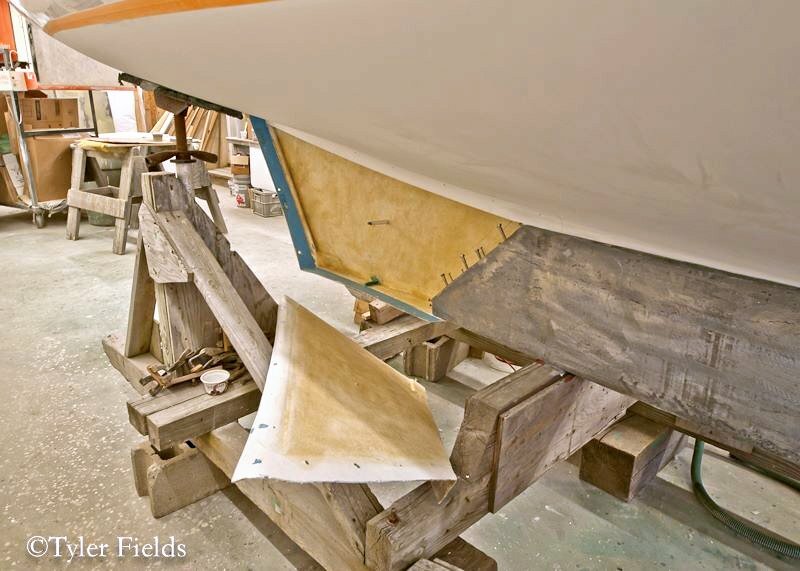 This sail sheets to a traveller designed to provide perfect sail trim when close-hauled, so there is no loss of sail performance (compared to an ordinary double-sheeted jib). 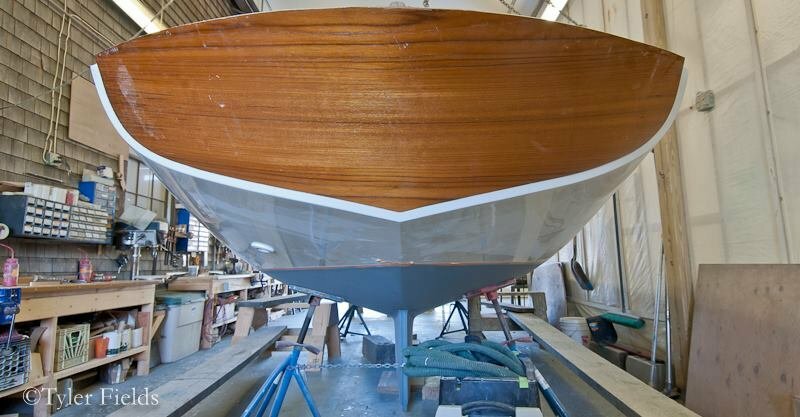 What a convenience and joy it is to tack this boat without having to touch any line. At the forward end of the cockpit there is standing room to handle halyards, etc. They lead aft from the mast to a console in the little space where the coamings come to a point. Winches on both sides of the cockpit are used for spinnaker sheetlines, and one is used for the jib sheet, though it is not always needed to do the job. Most of the fixed hardware are bronze castings. The travellers and sheetline blocks are of stainless steel or aluminum, as appropriate. 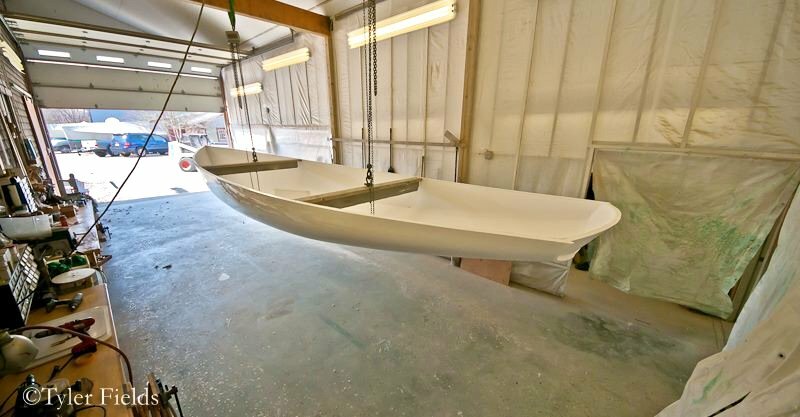 The mast and boom are painted aluminum and resemble traditional wood spars. 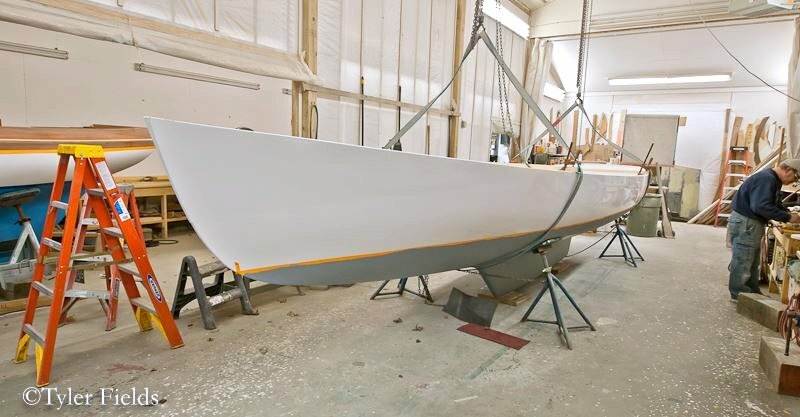 The jib club is painted spruce, matching the rest of the rig. 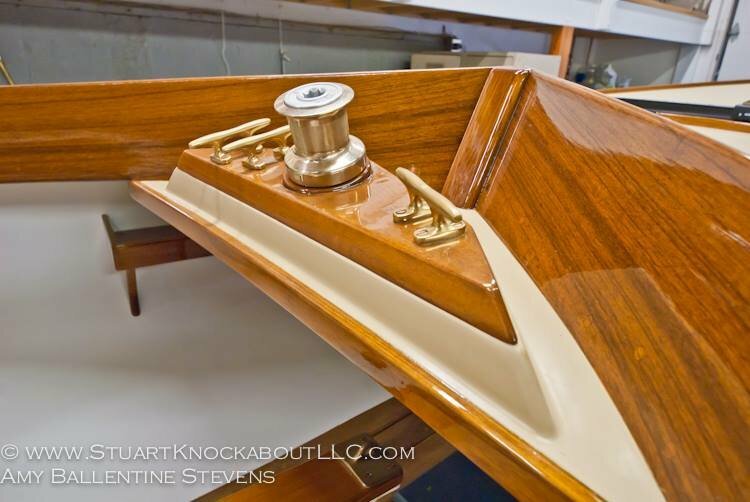 Keel fastenings are stainless bolts. 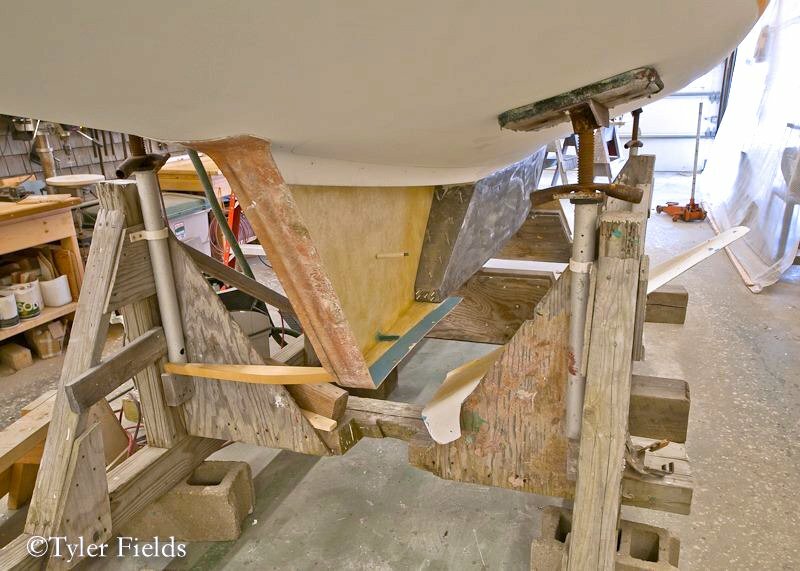 A fixed high-capacity bilge pump is located on the center­line under the cockpit sole aft of the centerboard trunk. The intake is at the low point of the bilge with a discharge aft under the stern. It is activated by a removable handle, which can be operated by the helmsman without leaving the tiller. Depending on your need and usage, we have 2 options for Electric Propulsion. 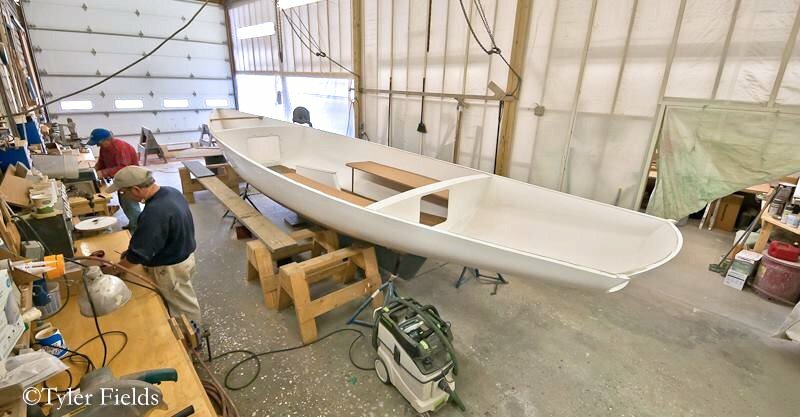 An Electric outboard can be added with relative ease and low cost. 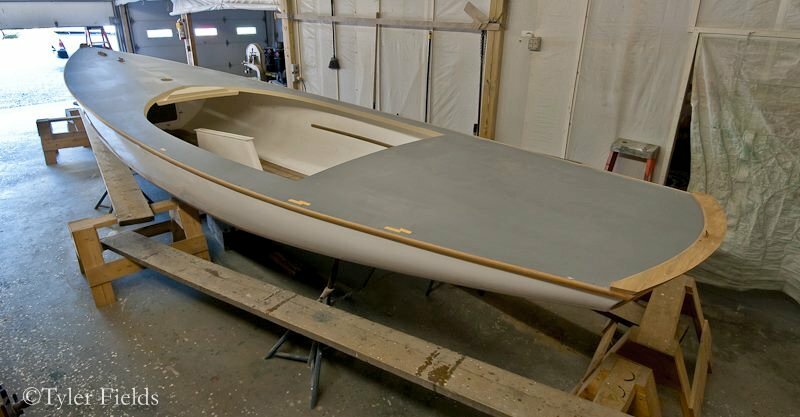 If more sustained and frequent power is needed, we can install an Oceanvolt sail drive. Both propulsion options are explored on our Motor Options page. 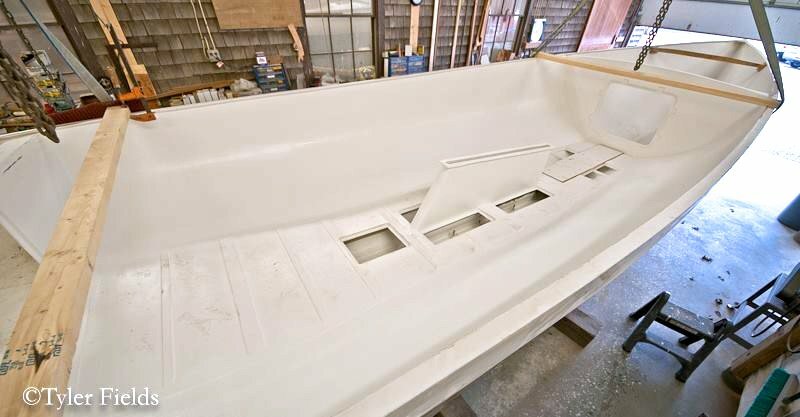 Each boat is built with foam-cored fiberglass "sandwich" construction, resulting in great strength and less overall weight. 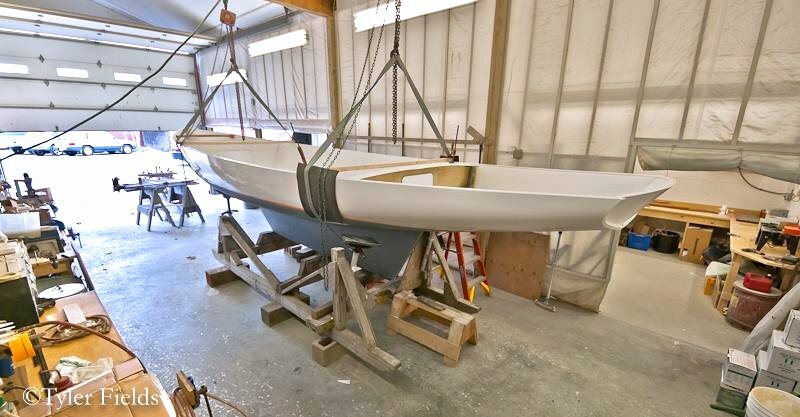 This permits the addition of 400 pounds of keel ballast to bring the completed boat up to her designed displacement, thereby increasing her capability to carry sail into a good breeze of wind. The interior of the cockpit is painted with white gel-coat, to brighten and provide attractive color contrasts. This surface requires no maintenance other than occasional cleaning with water. 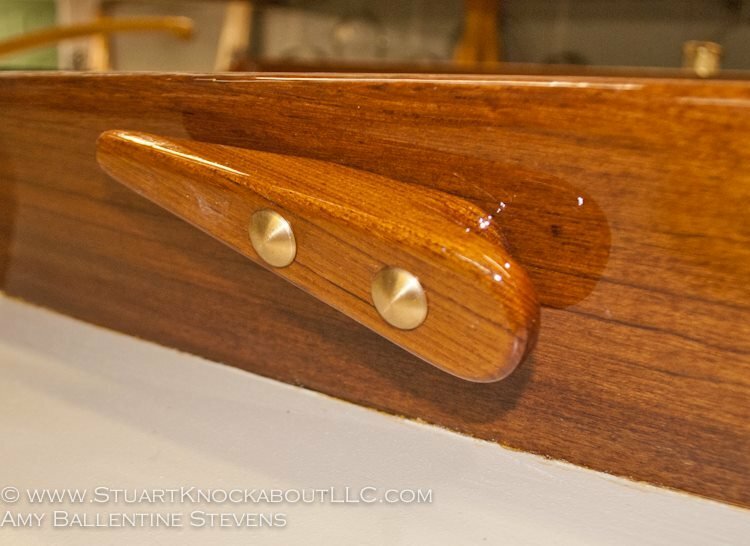 The cockpit sole is teak and is appropriately arranged with removable sections. 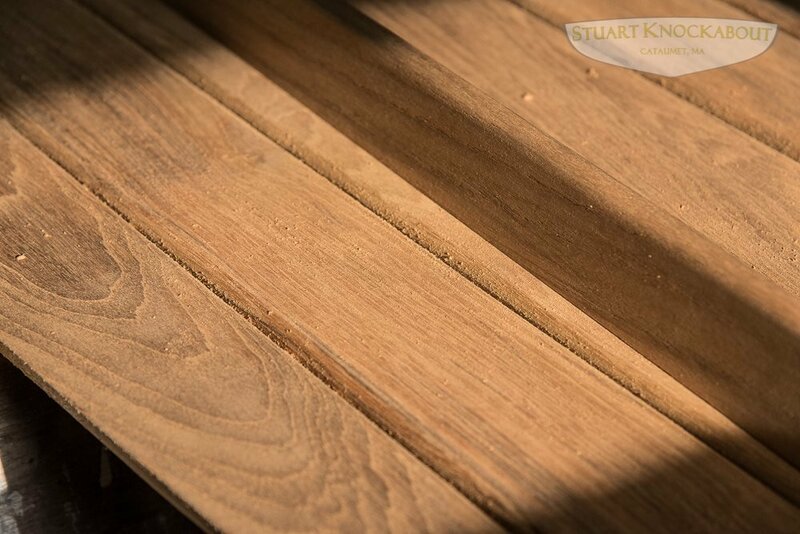 Coamings, rails and trim are also teak. 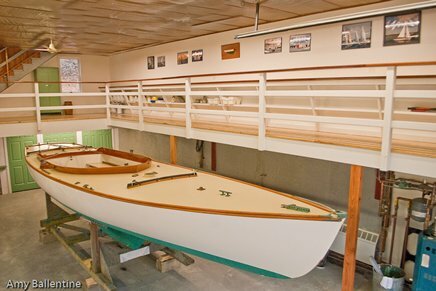 Seats are plywood (or optionally, teak) painted the same buff color as the spars and decks. 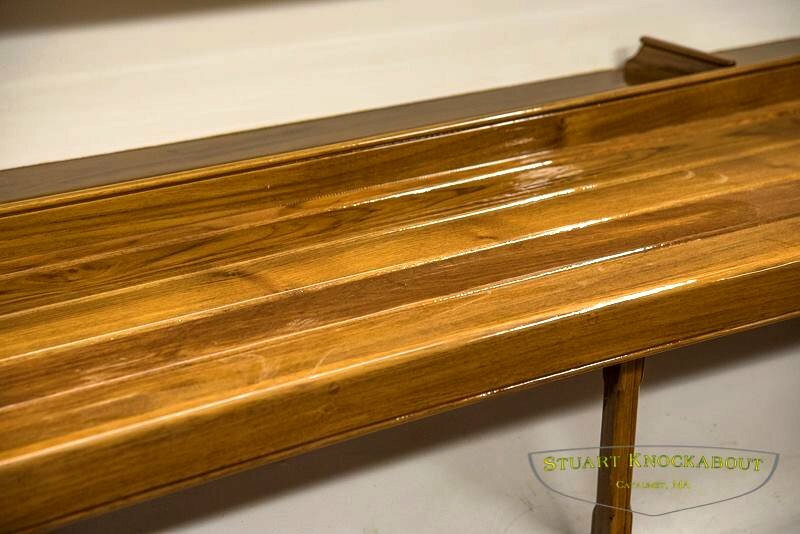 Optionally, the seats may be made in teak and finished in either varnish or oil. 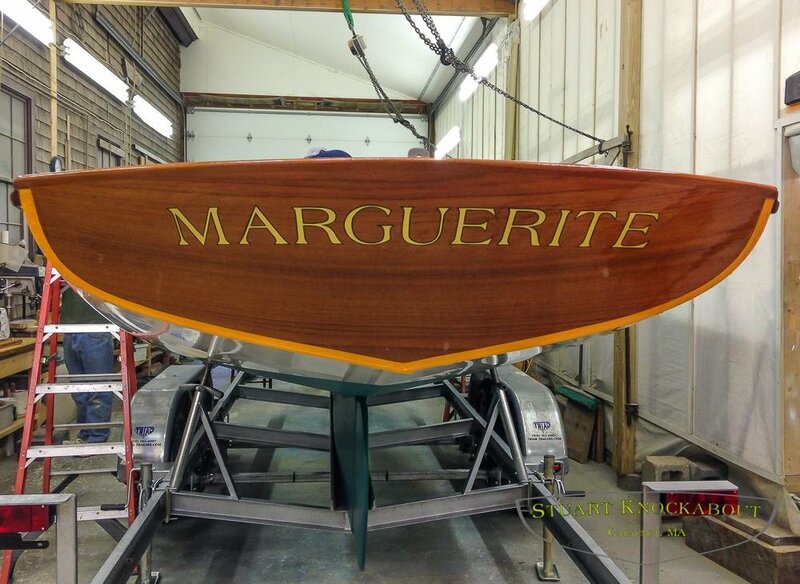 The decks are fiberglass finished in gelcoat with a surface texture of painted canvas. 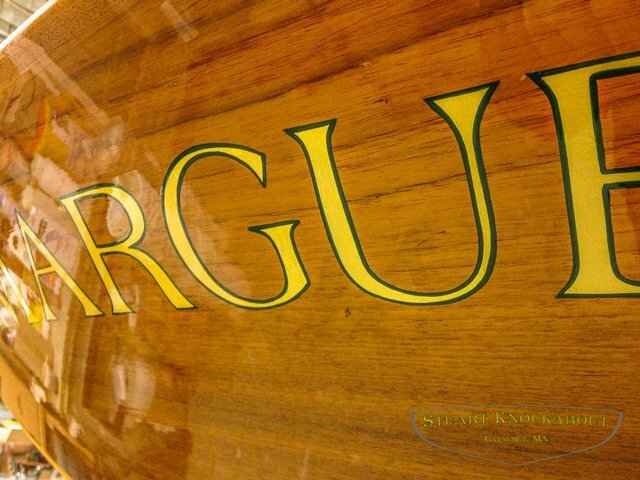 She has a beautifully shaped transom finished in varnished teak, to round out as close a resemblance to a wooden boat as practical. 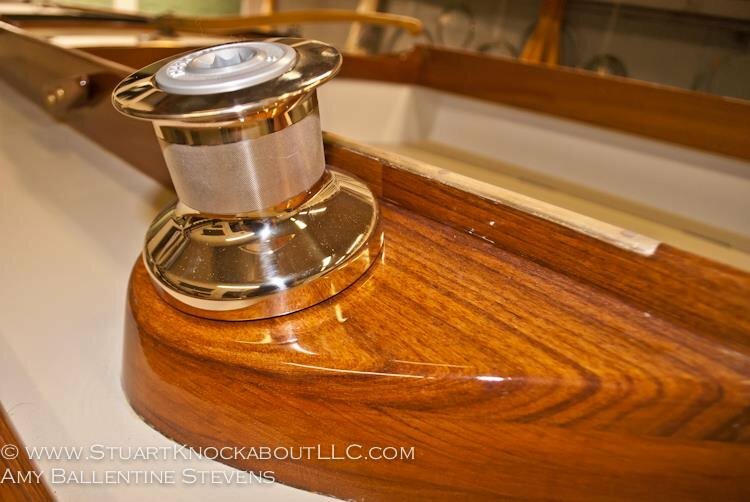 Toe rails, rubrails, coamings and other trim pieces are also teak. 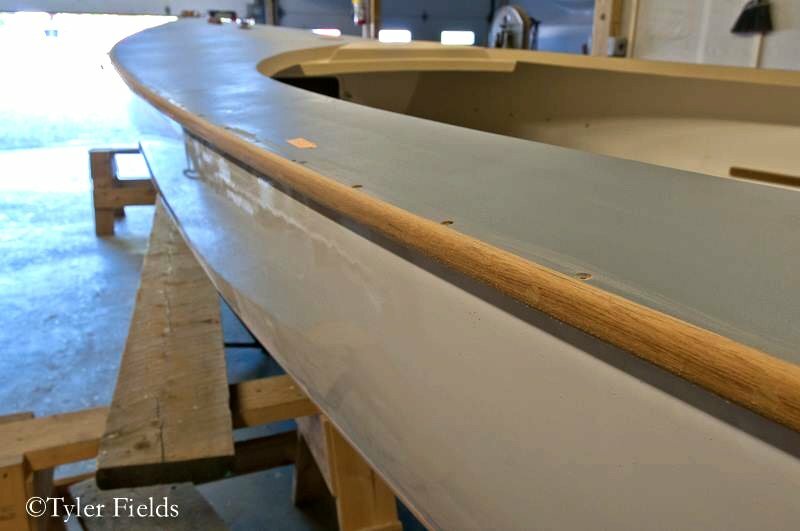 The boat has the same exquisitely clean, pleasing appearance of the original L. Francis Herreshoff model. Joan Perkins of Padanaram Sign Shop installed the name on SK81. All done by hand, gold leaf is an incredible process to watch and the finished product is always beautiful.